Not in my backyard. This phrase encapsulates both the greatest challenge and the greatest opportunity for civil society. There are many things I dislike about ancient Greek culture (just look at some of my posts about their theatre to see what I mean). But one thing I think the Greeks got right was their attitude to the polis; the idea that we’re only whole when we actively take part in the community. 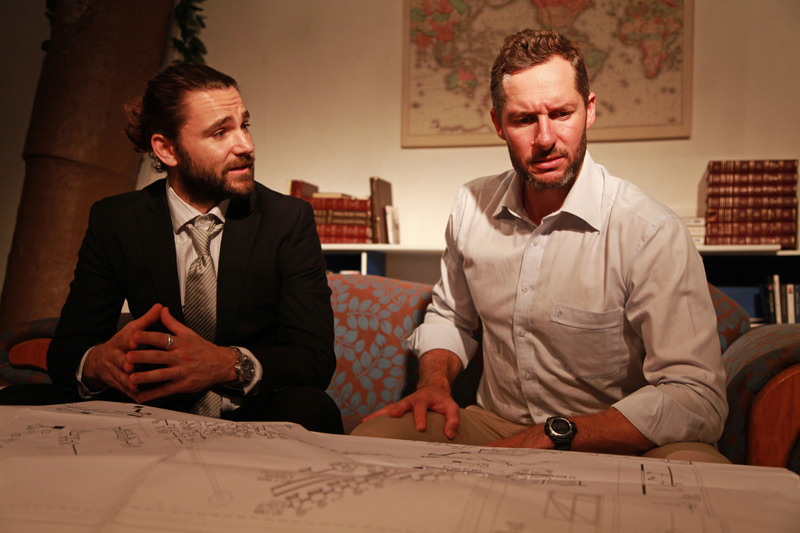 C J Naylor’s thought provoking new play is about Nimby-ism. A group of local residents are challenged by a planned urban development. Not in my backyard, they say. The threat politicizes them. Is this a good or a bad thing? The play seems to put little faith in the political process. And the politicization of the locals seems to go little further than their own narrow concerns. Perhaps high rise development is necessary. People do have to live somewhere. And how sprawling do we want our cities to become? The locals’ attitude seems to be based simply on the idea that they were there first. Are they claiming to be an unacknowledged indigenous group? Naylor’s script is intriguingly ambiguous. Samuel Smith is the appropriately sleazy developer, fun to portray, easy to mistrust. But the locals are not particularly admirable either. Alan Long and Estelle Healey play mature residents with the script’s intended kookiness, which allows two possible readings of the characters: that they are either lovable, or laughable. Zazu Towle and Matt Hopkins play a younger couple, likable but difficult to look up to since they seem to be fighting for their right to sit on their couch. There are, however, some nice comic moments from all the actors. Sascha Hall as the council bureaucrat delivers some wonderful deadpan disdain. This is Brave New Word’s third production of original Australian writing. It’s great to see a young company investing in this. There should be more of it. With its simple, direct and unadorned dialogue, and its reliance on short scenes (which this production didn’t deal with well), Dancing Naked in the Backyard feels a lot like television. However, that’s probably appropriate. After all, the theme is the challenge, and necessity, of political engagement, and that’s something that should be discussed in every Australian lounge room.